The following is an analysis of how the Seventh-Day Adventists view the Tribulation. The Investigative Judgment — The SDA's cornerstone doctrine of investigative judgment is both unbiblical and anti-biblical. The doctrine is unbiblical because there is no true biblical basis for it. It is anti-biblical because it denies the finished work of Jesus on the Cross. It is also downright silly in nature because it assumes that Jesus, who is omniscient, must take 160+ years (and counting) to evaluate and judge the works and sins of all believers. The Tribulation — There are actually two concepts of the Tribulation that can be found in SDA literature. One is the concept that the Tribulation started in 1844 when the "apostate Protestants" began to persecute Adventists. This persecution, of course, intensified (supposedly) when Adventists began to emphasize the essentiality of Sabbath-keeping. The other concept of the Tribulation is that it will be a period of intense persecution that will immediately precede the Lord's return. Doug Batchelor says he thinks it will last no longer than two months.5 During this period of time, the United States and the Vatican will be unified in forcing the observance of Sunday worldwide as the proper day of worship. Both views are unbiblical. The Bible clearly teaches that the Tribulation will be a period of seven years during which time God will pour out His wrath, first on rebellious Gentile nations (Revelation 6-11), and then on the nation of Israel (Revelation 12:13-17). The period will begin when the Antichrist signs a covenant that will guarantee peace in the Middle East (Daniel 9:27). It will end seven years later when a great remnant of the Jews accepts Jesus as their Messiah (Zechariah 12:10 and Romans 9:27-28; 11:25-29). The concept of the U.S. allying itself with the Vatican to force Sunday-worship upon the world is downright ludicrous. This is one of Ellen White's most flagrant false prophecies. Since the time she wrote this prophecy in the 19th Century, the U.S. has abolished all Sunday observance laws (often referred to as "Blue Laws"), and the country has become increasingly secular and pagan. Her scriptural justification for this weird prophecy is a good example of the SDA's tendency toward nonsensical interpretations. She asserted that chapters 12 and 13 of Revelation teach that the Antichrist (the papacy) would dominate the world for 1,260 days before suffering a fatal wound. She converted the days into years (without any textual authority for doing so) and then decided that the ending point to the 1,260 years was 1798 because that was the year when, during the French Revolution, a French general conquered Rome and took Pope Pius VI captive. She then counted backward 1,260 years and proclaimed that the era of papal dominance over the nations of Europe began in the year 538 AD. Notice that the first thing she did was to violate her own rule that a prophetic year always equals 360 days. This was a rule that had been laid down by William Miller in calculating the date of the Lord's return, and that rule had been accepted by all Adventists. A third problem with Ellen White's calculations is that the papal setback of 1798 was not the first in Vatican history. During the time period she identified, there were at least 20 anti-popes who set themselves up in opposition to the reigning pope, and there was a period of 70 years, from 1309 to 1378, when the papacy was actually moved to Avignon, France. The fourth problem with Ellen White's calculations is that 1798 did not even begin to mark the end of papal influence worldwide. On the contrary, during the 20th Century the papacy was solidified in its power and authority and continues to this day to exercise great authority among the nations of the world. SDA apologists usually respond to the modern day resurgence of the Catholic Church as the healing of the "fatal wound" that is referred to in Revelation 13:3. But this prophecy refers either to a wound experienced by the Antichrist or to the revival of the Roman Empire in the end times. Finally, the prophecies in Revelation 12 and 13 have absolutely nothing to do with the papacy. They simply declare that the Antichrist (a person) will focus his demonic efforts on the annihilation of the Jewish people during the last 1,260 days of the Tribulation. So, why did Ellen White conjure us such a bizarre interpretation? Because she wanted to use it as a basis for asserting that the second beast of Revelation 13 was the United States! Here's how her reasoning went: Since the power of the first beast waned in 1798, the rise of the second beast (Revelation 13:11ff) must have occurred at that time, and the only candidate on the world scene was the United States which was rising to power at that exact time. Thus, the second beast of Revelation 13 is always portrayed in SDA literature as a bison with either an American flag or a map of the U.S. in the background. This, to say the least, is a reckless interpretation of Scripture, particularly when you consider the fact that Revelation 13:11 specifically states that the second beast "had two horns like a lamb." Somehow, the lamb became a bison which represented the United States! In the next part of this series on what the Seventh-Day Adventists believe concerning the end times, we'll analyze how they view other key eschatalogical events. 5) Doug Batchelor, Anything but Secret! a booklet published by Amazing Facts Ministry (2004), page 22. 6) Philip Schaff, History of the Christian Church, volume IV (Eerdmans Publishing, 1989), page 212. What is the purpose of learning about SDA beliefs on Trib. etc? During these extraordinary times of change in the middle east and Palestinian statehood, could we not be refreshed in the truth of what is to come? I know that I need review and reassurance on what the true prophecy of the bible says. No disrespect, but other beliefs just muddy the water for me, especially since I am just a 'regular folk'. God Bless! Many ministries grow comfortable and it is easier to get stuff from a book or memory then to seek God's revealation into what is currently going on. People get busy with the ministry etc. Plus people like to hear sensational and semi-senstational exposes on cults, non-christian groups etc. Thie is the day of the discerment ministries rather than the teaching. Or it could be that there is a major problem with the 7th dayers making in roads into some christian camps. therefore , as we know, that in the last days these groups will become powerful, he is exposing them. Or it could be the fruits of association with some self-edifying discerment people. I think everyone knows who I am speaking about. he is starting to appear in this ministry alot. I am glad that others have noticed the change in direction though. The early radio program was very biblical on end times. There is nothing wrong with the change of direction, if sincere for the kingdom and not just making a ministry, but be honest and explain it to the people. Warning the Body of Christ about false teaching isn’t optional, it’s a command. Jesus warned us to be on the look out for false teachers. Deception heads His list of the last days and S.D.A. is one of those deceptions. Good question, Lily! Like John and E.I. said, we're in a time where Satan's trying hard to obscure Christ's return. Concerning Bible prophecy in particular, the SDA are masters at it. Jesus in Matthew 24 concerning end times signs warned the most about false teachers and deception. Bible prophecy ministries are just following Jesus' lead and pointing out that sign and correcting the false teachings so people aren't led astray. No matter what a ministry's focus is on, in the end it has to boil down to the fate of people's souls. Pure Bible prophecy teaching is discernment, John, and I don't believe we've lost our focus one iota. I'm not a SDA but at least they believe in the rapture and other biblical truths. I don't care if it s before during or after. Look around the time will be shorten to save the elect. Let's be ready whenever it happens. "The Bible clearly teaches that the Tribulation will be a period of seven years during which time God will pour out His wrath, first on rebellious Gentile nations (Revelation 6-11), and then on the nation of Israel (Revelation 12:13-17)." 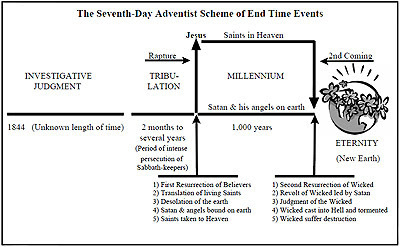 After a Bible search through Revelations...I did the search using eSword (a digital Bible), ...and using the King James Version, ...I did a search for the text "seven" and and another text search for "years", and I couldn't find where ... "the Bible clearly teaches that the Tribulation will be a period of seven years during which time God will pour out His wrath." To begin with, if you look up the word tribulation in any Strong’s or Young’s Concordance, you may be surprised to discover that almost every reference is about what Christians pass through, not what they escape from. Jesus Himself told His followers, “ ‘In the world you will have tribulation’ ” (John 16:33; emphasis added). Paul told his converts that “we must through much tribulation enter into the kingdom of God” (Acts 14:22, KJV; emphasis added). On the Isle of Patmos, John wrote that he was a “companion in . . . tribulation” (Revelation 1:9; emphasis added). Speaking to His church in Smyrna, Jesus stated, “ ‘I know your works [and] tribulation’ ” (Revelation 2:9; emphasis added). Therefore, at least in these texts, the idea of Christians escaping tribulation doesn’t fit the New Testament evidence. Again, correct me if I'm wrong, but "did" the wrath of God fall upon BOTH the "rebellious Gentile nations," and then on "the nation of Israel?" From what I have read in the Bible, I understand that the "wrath" (aka - the "plagues") fell upon Egypt's Pharaoh and his land, but didn't affect the nation of Israel...so "similarily" will the End Times "wrath" of God (aka - the "7 last plagues") fall upon the nation of Christian spiritual believers, or just like in the times of Egypt, will it fall only upon the "heathens?" My understanding is that the plagues will ONLY fall upon the "heathens," and the "believers" will be spared, and in the end...delivered from the last plague (the 7th) - (aka - the 2nd coming of Christ). Robert, because the people who entered the Tribulation did not accept Jesus and be included as part of the Church before the Rapture occurred, they will experience God's wrath during the Tribulation. Look particularly the massacre of believers during the Fourth Seal Judgment of Rev. 6:9-11. Fortunately, "a great multitude that no one could count, from every nation, tribe, people and language" (Rev. 7:9) will come during the Tribulation to accept Jesus as Savior. God will provide witnesses during the Tribulation that are not from the Church so that the great multitudes that come to faith in Christ during the Tribulation come about (Rev. 7:9). There is no doubt that there will be a great harvest of souls after the Rapture (Rev. 7:9-14). Some will be convicted by the Rapture itself. Others will be converted by the preaching of either the Two Witnesses in Jerusalem (Rev. 11) or the 144,000 Jewish disciples who will proclaim the Gospel (Rev. 7). Some will repent in response to the judgments of God (Isa. 26:9). Others will respond to an angel of God who will preach the "eternal gospel" to all the world at the end of the Tribulation, right before the final pouring out of God's wrath (Rev. 14:6). By Jesus' Second Coming, everyone left on the Earth would have had to make a decision for Christ or not. We are told that the Tribulation Saints will be protected from only two of the judgments. While Trumpets 1-5 must affect all of humanity for they're judgments that damage the entire earth quite severely, Revelation 9:4 says Trumpet 5 and inferred in verses 20-21 for Trumpet 6 that they're judgments for unbelievers only. The natural disasters of Trumpet 7 would again affect everyone on the planet. Correct me if I'm wrong, but 1260 days, 42 months and "time, times and half a time", all refer to a period of 3.5 years, not seven years. It's quite interesting that during the days of Elijah there was a period of 3.5 years of tribulation in the form of the drought and famine in those days, and yet God supplied all of his servants' needs. In respect of the day-year principle the author talks about "textual authority", which I assume he means some verse explicitly stating "a day for a year", but how then are we to consider the prophecy Jesus gave about how long his ministry would go on in Luke 13:31-33? He explicitly used the term "day" when he said "to day, and to morrow and the third day I shall be perfected" pointing to his death and resurrection as explained in verse 33 when it says "for it cannot be that a prophet perish out of Jerusalem." Now Jesus' ministry did not last 3 more days, but 3 more years... and there is no immediate text that says that we must apply the day-year principle to this prophecy! God bless! As a Christian all this is trivial. They (SDA) teach that Jesus Christ is the savior and there is no other way to heaven except by accepting his grace on the cross for your sins. All protestant denominations teach this. This simple concept is the only one that truly matters. Let us therefore come boldly unto the throne of grace, that we may obtain mercy, and find grace to help in time of need. Hebrews 4:14-16. Now what is really strange is why many Christians believe that Jesus is just sitting down for 2000 years!